I don't often read novellas, because most don't have enough going on to keep me interested. 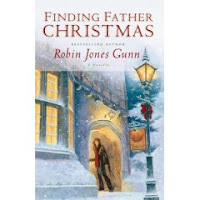 However, Robin Jones Gunn crafts a wonderful tale with Finding Father Christmas. Miranda Carson travels to England one Christmas to find the father she's never known. As this tale begins, she enters the Tea Cosy on Christmas Eve. She's already questioning her decision to leap the Ocean in pursuit of the unknown. All she has as a clue is an old photo. The story unwraps in the span of two days, with delightful twists and turns. The characters are warm and friendly, and I felt like I was being welcomed into their lives along with Miranda. And Miranda's strong need to answer the questions about her father resonated. And then she considers a decision which goes against her quest in an effort to protect her new friends. This story is a delightful read, that unravels easily. I thoroughly enjoyed it and think you will, too, if you're looking for a short escape from the Christmas hustle and bustle. Publicity? I can tell about books? Carpenter's Son has Canteen Dreams!!!! !